Cat’s practice and teaching has been inspired by a variety of traditions, including Ashtanga, Iyengar, Yin and mindfulness practices. As a teacher, her “bread-and-butter” is Vinyasa Flow, though she teaches Power, Yin, Gentle, Restorative and meditative practices as well. 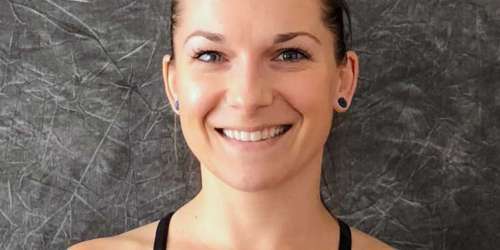 Her approach blends a respect for yoga tradition with a scientific understanding of anatomy and biomechanics to keep you safe, while educating you on how to make the practice your own. In Cat’s classes, expect to build mindful energy while journeying through a sequence designed to create warmth, space, and balance in the body, mind, and heart. Her primary goal is to help you connect with your body, and create space to let the teachings of the practice unfold from there. Cat first stepped into a yoga class in 2006 in college, after pulling herself out from a period of clinical depression. It was a few years before she committed herself to a regular practice, but the healing light of yoga forever changed the course of her life. This awakening led her to pursue a 200HR certificate with the intention of sharing the power of yoga with others. Yoga is the only discipline which continues to capture her heart and curiosity even after over a decade of practice. Cat has over 1,200 hours of teaching experience since completing her 200HR in 2011 with Lisa Salners and Damien McVey at Just Yoga. In 2015, she took an eye-opening Intensive with Paul and Suzee Grilley on Functional Anatomy and Yin Yoga, and she concluded her 300HR advanced training under the mentorship of Lisa Salners in 2017. Always looking to expand her knowledge, Cat has also taken workshops and intensives with such internationally acclaimed teachers as Jason Crandell, Mary Ezraty, Gary Kraftsow, Kino MacGregor, Seane Corn, Kathryn Budig, and Jules Mitchell. After growing up in Corona, Cat made the move to North County San Diego in 2013, where she now happily resides with her son and husband. In addition to teaching at Just Yoga and throughout San Diego county, Cat shares instructional yoga content, courses, and inspiration over social media to a global audience of over 26,000. She is deeply grateful for the opportunity to study and share yoga with others, and looks forward to meeting you on the mat!